We love seafood in our family. Just recently we threw our BBQ on for a midweek grilled king prawn feast. OK, we had visitors to impress, but I'd do a lot of things for grilled prawns. One of our more lazy weekday seafood dinners has been pasta and tomato clam sauce. I must say I got a bit tired of that and were looking to use some White Clam Sauce. Getting hold of fresh clam meat helped a lot, as I bought about 2 pounds that need to be used up within a few days. 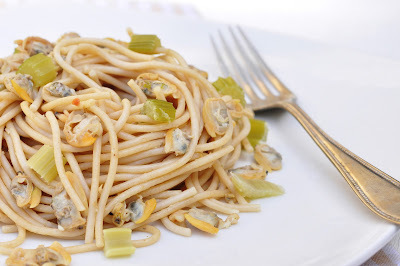 This sauce satisfied my all my expectations: the taste of the clams were supposed to main act, with a little help of salty anchovies, some crunchy celery and a little creamy cream to coat the pasta. I made a huge pot of that sauce and kept the leftovers in the fridge. The sauce got better by the day, as the clam flavor got stronger and stronger. The true taste of the sea that doesn't need much extras. Bon appetit! Meanwhile, heat butter over medium heat in a pan. Fry minced garlic and anchovies for 2-3 minutes, then add celery stalks. Cook for another 2-3 minutes, stirring occasionally. Add fish stock/clam juice and clam meat. Bring to a boil, then simmer for another few minutes. Take off the heat. Stir in Creme Fraiche/cream and season with salt and pepper. Drain cooked spaghetti. Transfer back to the pot and stir in the the clam sauce. Transfer to plates and garnish with grated Parmesan cheese. Serve immediately.